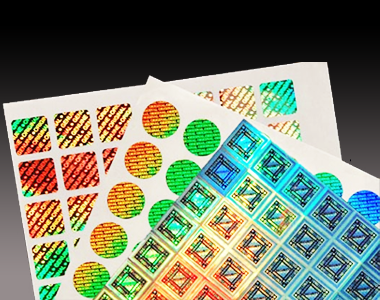 We have different designs adhesive tamper-evident security Hologram Labels to security,authentication and protection against counterfeit. These Hologram Label make size availablefrom 5mm*5mm to 150mm*150mm. Customized special shapes, size, serial number, over pritingand Barcode printing also is available on these holograms which can have different material,such as tamper evident, high security VOID Tamper Evident, high security Honeycomb Tamper Evident, high security ORIGINAL Tamper Evident, Transparent Tamper evident, etc. Customer Can Add Enhanced Security Features or Other Options Onto Generic Holgoram Labels as: Laser Etched Serial Numbers Black Serial Numbers Tamper Evident 'VOID' Tamper Evident 'ORIGINAL' Tamper Evident Honeycomb Tamper Evident Transparent Hologram Label Laser Hidden Text Morie Hidden Text Micro Text Special Shape Cutting Barcode Over Printing UV Hidden Image Printing Dual Serial number Sticker in roll. Available colors are :- Silver,Copper,Gold, Forest Green, Twilight Blue, Silver Void, Neon Red, Neon Purple,Roya Blue, Turquoise, Black , Semi-Transparent, Silver with gold, Blue,Green and red etc.